So here's the next evolution in LEGO MOCs, LEGO puppetry. It's such a cool idea that I'm wondering why it never came up before... very simple in it's construction. 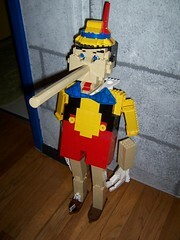 And it would be a cool construction project with kids -- build your own LEGO puppet, then have a puppet show... It does have a 'craft' element to it if you use fishing line, but that's something easy to thread through a Technic brick, without damaging bricks... I applaud Matt Armstrong (Monstrbrick) for this cool idea!